Gaud develops sculptural projects interconnected with photography and its impact on people through the long History of photography. Her work depicts how the wide and democratized use of the camera has entered in people’s life. Each sculpture tells about people's public image and how their intimacy, their dreams and desires have joined and evolved in the public sphere through photography. By working on this project, Gaud has created and built a unique bridge between the two media: photography and sculpture. From the 20th century to nowadays, the increasing use of personal cameras followed by the connected devices explosion, have marked a turning point in the way people take pictures or strike the pause. In the first half of 20th Century, photography was used by only a few privileged families, and for the others, sometimes once in a lifetime. At that time, films needed a long exposure time and people had to stay stiff. In the second half of the 20th Century, more families started to have access to photo cameras. People were striking the pause in a more playful way during families’ events or friendship’s dinners. Pictures had to be printed to be seen and they used to fulfil a function of preserving and recalling memories. Nowadays, with the spread of individual smart phones, and dominance of social media, the relation to photographs has undergone a natural revolution in people’s lives and behaviours. People don’t always pay attention to the quality of the pictures they take, as they can shot and re-shot a countless number of them easily and for the same cost! The composition of a group’s picture has profoundly evolved: groups of people used to be photographed horizontally. With the arrival of smartphones and the selfie culture, some group’s pictures are often taken vertically, showing a distorted composure: usually with the large head of the photographer in the foreground, and the rest of the group’s small heads in the background. If not everyone looks at the camera, it doesn’t really matters as pictures can be re-taken many times or on any other occasion. On the contrary, selfie’s enthusiasts take care of details as they use photography as a major social media’s tool. 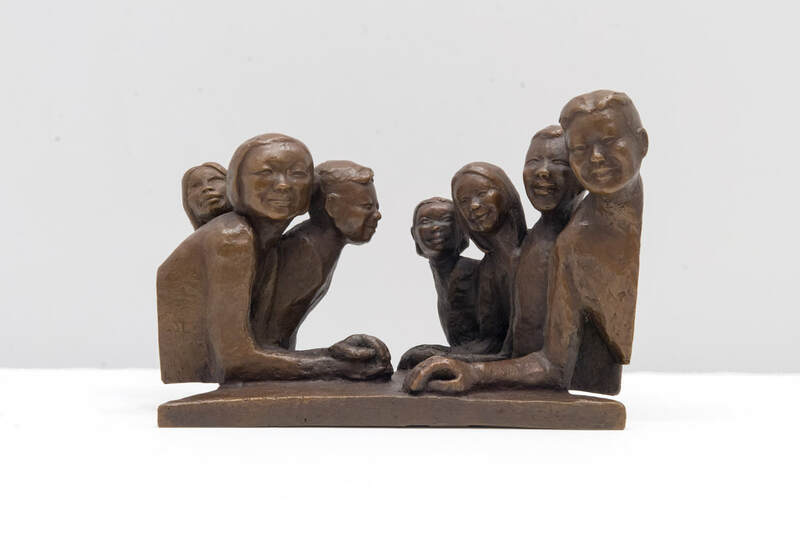 Because it is infinite, Gaud started working on a first series: human beings gathering around a table as a family or as a bunch of friends, a subject that resonates with each and every one of us’s own experience. 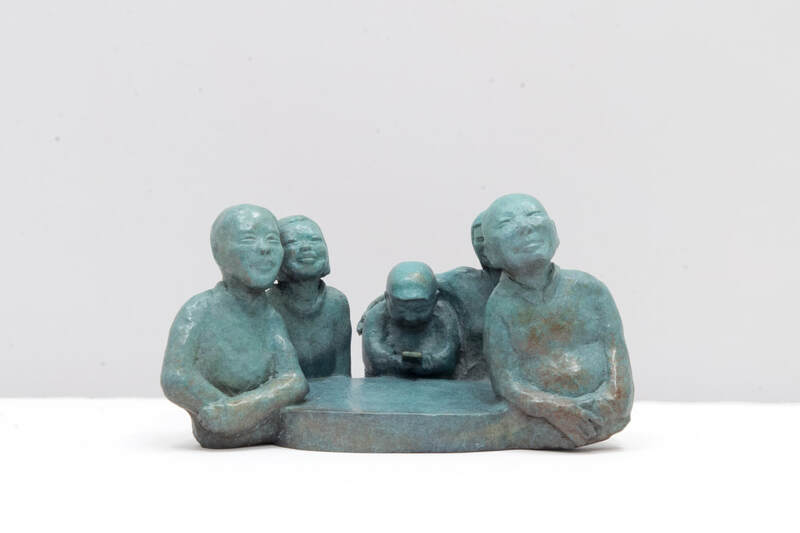 She favours small scale sculptures, as she wants to reflect the intimacy and physical closeness that we share with a printed or small screen digital image. 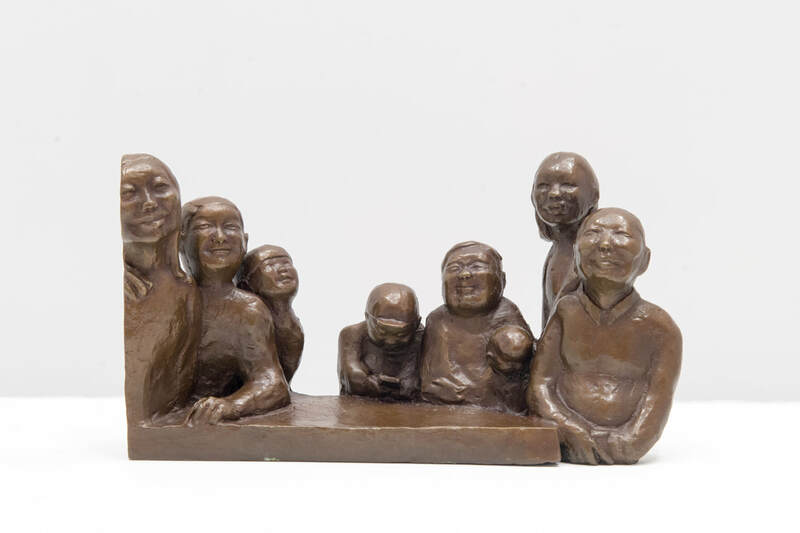 In her sculptures, some of the people are cropped, like in a photograph, when people are not entirely framed. She plays with the perpective by flattening the 3D sculpture in order to keep the idea of the photographs’2D flatness. With this project, Gaud has created a unique artistic way of translating photographic composition into sculpture. And unlike most of digital photographs that will never be seen again because there are somewhere in the “cloud”, bronze sculptures perpetuate a tradition of witnessing the time and fulfilling a role of memory since bronze remains eternal. 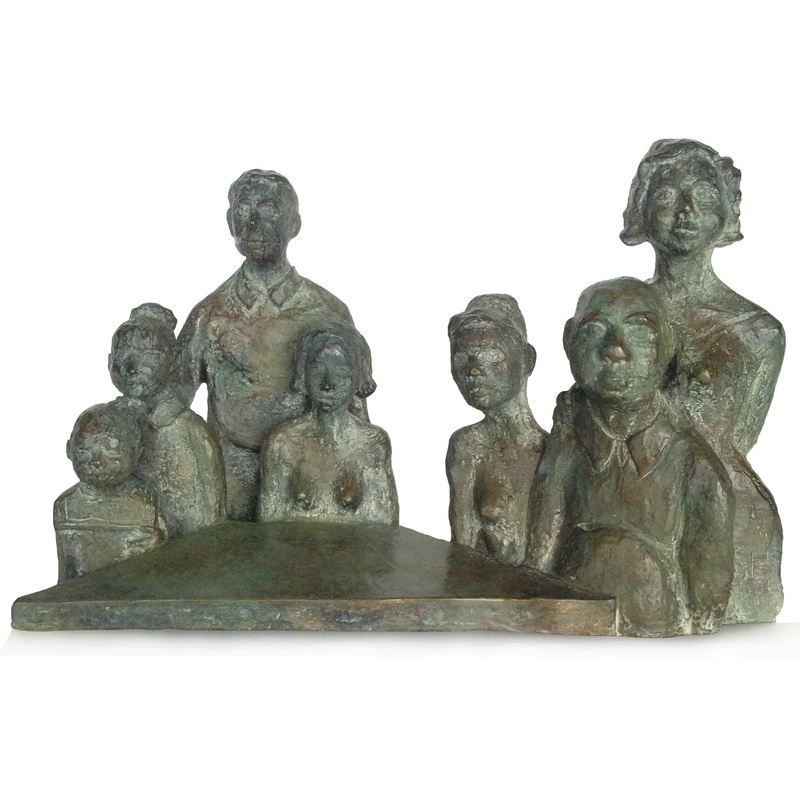 Family Dinner 1, Bronze (tirage 1/8 + 4 EA), signée et cachet de Fonderie Rosini, France). 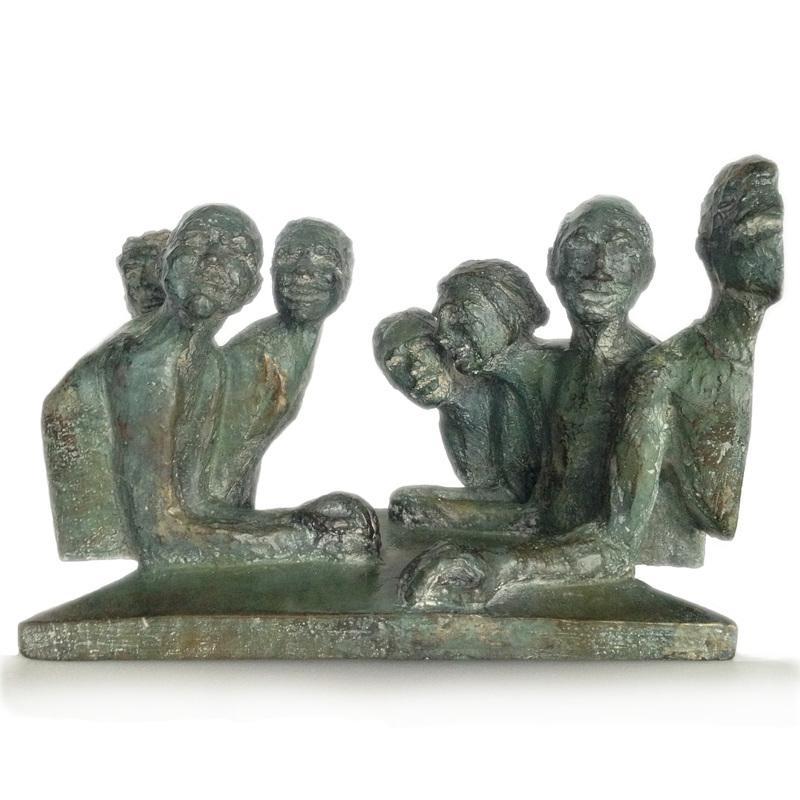 Family Dinner 2, Bronze (tirage 1/8 + 4 EA), signée et cachet de Fonderie Rosini, France).